Happy New Year – A little late…we’ll blame the kids! The Perfect Mother – HA HA HA HA!!! Carry on Camping – be careful that Karma’s not packed in the cool box! How Can Babies Do Yoga? by Nicky Roeber, Online Horticultural Expert at Wyevale Garden Centres. Most children love watching wildlife, whether it’s from a window or nearby when they’re playing outside — it never fails to inspire a sense of wonder and curiosity. 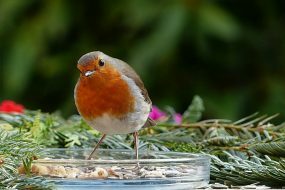 Help your kids welcome animals to your garden by creating feeding stations for different types of wildlife: this could include making a bird feeder out of a large empty water bottle or sprinkling some bread down for them in a concealed corner of the garden, out of the way of any pets. You could also get them to crush up some pet biscuits and lay them out for hedgehogs to nibble on or scatter some peanuts out for adventurous badgers. Taking steps like this can encourage wildlife into your garden, which is sure to be a hit with the kids! Whether you want to get them out in the garden more or you’re looking for an activity to bond over, creating a garden project is a great way to spend quality time together! At Wyevale Garden Centres, we’re passionate about gardens and want to spread the joy of gardening. That’s why, street by street, garden by garden, window-box by window-box, we aim to pass on ideas, inspiration and valuable tips to make garden-lovers of everyone. Please be aware that this website uses a mixture of paid-for advertising as well as pay-per-click programmes and affiliate marketing.